This is a good novel, which still looks pretty topical, on the tensions within a multiracial society.The race riots of the 13 May 1969, which caused hundreds of deaths and led the government to declare a state of national emergency, are present in the memories in Malaysia. These are the events that give landmarks to the novel, a poorly defined framework because we are far from a historical novel. The excellent introduction by Professor Mohammad A. Quayum reminds us of the very special characteristics of Malaysia. After the independence in 1957, it was decided that Malay becomes the national language; the loss of status of English was worse after the 1969 race riots. Similarly, in 1971, the rights and privileges of the Malays were reinforced and the NEP (New Economic Policy) introduced to reduce economic disparities between Malays and Chinese. Different characters are central to the book, they represent the main races but also the opposing forces in the development of the political and religious structures of the country. They all know each other and often since college. Panglima and Omar are extremists concerning the rights of the Malays and the role of Islam. Other Malays (Dahlan, Lebai Hanafiah Siti Sarah) want a Malaysia that surpasses that racial segregation. It is the same for Yun Ming, a Chinese, an official of the Ministry of Foreign Affairs, who will fall in love with Siti Sarah, who can no longer live with Omar. Sara’s father, Lebai Hanafiah, a Malay, a former teacher who becomes the narrator of a chapter of the book is a bit the spokesman of the author: “they are so many who want to force you to follow the right path. Each one’s path is the only right one. I am tired of seeing the folly spread in the name of such right paths. I fear those who seek to come between me and love for all humanity. They are the source of hate and destruction “(p. 138). All these characters have nostalgia for their simple and open contacts during university. After May 13, everything becomes more difficult, many camouflage themselves, they take postures, they protect themselves. But the author does not develop these historical references, this is a book for Malaysians and not for Europeans. No didacticism in this book which is very different from the more historical novels by Tan Twan Eng who have recently experienced and rightly so a great success. He and his father left Ceylon to Singapore in 1938, he was then twelve years old. He learns Malay which he will speak perfectly but English is his first language. In 1960, after studying at the University of Singapore, he is a lecturer at the University of Malaya. A Phd in Leeds allows him in 1967 to become professor in the English Department of the University Malaya then head of the department until 1978. 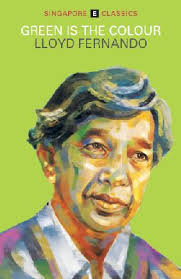 In 1976, he will publish “Scorpion Orchid” (2) a less sophisticated novel but announcing some of the themes developed in “Green is the colour.” In Singapore, many events turn into a riot because of the efforts of two unions to join together, a move opposed by British Realty, the colonial system. Few details about this period; this is not important for the author who focuses on several characters, Malay, Chinese, Indian but also English academics. The characters are quickly sketched except Sally, a strong personality, partly a prostitute, but also protective of some of these students. An interesting idea, the characters have met or want to meet Tok Said; Who is he? Is it a psychological campaign, a buzz; Is he a Communist agent or a pretext for the British police? Lloyd Fernando does not wait for his retirement, he wants to continue an active lifestyle; he studied law in England, and quickly creates in Malaysia a law firm. His wife, Mary, is the image of some of his characters: Eurasian, a half Italian and half Vietnamese father and a mother from mixed Portuguese blood in Malacca. “Cultures in Conflict” (1986) is a collection of essays on literature and the English language in South East Asia. Interesting texts on topics and colonial authors such as Conrad, Kipling and also Henri Fauconnier, author of a wonderful “Malaysia” (1930), translated into English as “The soul of Malaysia.” Some beautiful pages also on the major Malay author Shahnon Ahmad. Literature in Malay is considered the “national literature”, while the one written in other languages is mentionned as “sectional literature”. This discrimination has a direct impact: writers in English are not eligible for official financing or literary prizes unlike the situation in Singapore. For economic and technological reasons, English is developing. Fernando will publish two collections of short stories in English in 1968 and 1981. Some authors are his students like Shirley Lim, other authors such as Lee Kok Liang are well known for their short stories, but overall, we must recognize that these texts are of uneven quality. One should read Lloyd Fernando, he is very talented and important in the literary history of his country and with his desire to seek what is right. But his thinking on what constitutes a nation and how it is constructed and develops is quite topical for today’s Europeans. (1) Lloyd Fernando, “Green is the colour” – Epigram Books Singapore, 2012, 230 pages. (2) Lloyd Fernando “Scorpion Orchid” – Heineman educational books (Asia). 1976, 150 pages. (3) Lloyd Fernando, “Cultures in Conflict” – Graham Brash, Singapore, 1986, 250 pages. (4) Edited by Lloyd Fernando “Malaysian short stories” – Maya Press, 2005, 2 volumes. Pages 280 and 260.